Day 287: A Disappearing Act . . .
Like something straight out of a magic show, this week disappeared in nothing flat. One minute it was Sunday and we were getting ready for the week then next thing we knew it was Friday night and just like that another five days had gone by. “They” (someday we really want to meet “they” – must be a group of really smart people to know all this kind of stuff) but, we digress . . . “They” say time flies when you are having fun and “They” also say that as we get older time goes by quicker – we agree with “They” on both accounts. Regardless, it was a really good week and lots of great things happened and some just run of the mill stuff happened, but bottom line is that we are still here and enjoying each day as it arrives in the morning and closes down as the clock strikes midnight. Friday arrived with a surprise visit for Daughter #1 from Bruce Wayne – would had loved to see the look on her face when she opened the door and BW was standing there unexpectedly. To celebrate, we all decided to take in a movie that just opened . . . nothing like going to a movie and indulging in movie popcorn, Twizzlers and Junior Mints for dinner – washed down with an ice-cold fountain drink (always good to keep the Tums handy after such dietary indiscretions). Of course, since we were at the movies, we just HAD to stop in at the arcade to try our luck at the newest version of “The Big Claw” (many stories of winning stuffed animals and other great items . . . another blog to come on that subject). The new thing to try to accomplish is snagging an iPod, gift cards and yes, even an iPad. Well, must admit we tossed down a few dollars on this machine to no avail – but that didn’t deter us from pulling out a few crumpled dollar bills and try, try again. Alas, (there’s that Poor Yorick guy again) we didn’t win – but did make it a group effort and had a laugh or two at our own expense. When we got home, it was blog time . . . Brian popped over to the blog wine rack (yeah, shamelessly we have more than one) and was instructed to “Pick me out a winner, Bobby” – – – movie reference . . . first one to chime in wins a bottle of tonight’s wine . . . oops, digressed again – he picked a bottle that Andy the wine guy at Central Market South recommended. Andy used to be at the North Lamar store, but lucky for us has transferred to the south store – go see him! So, finally . 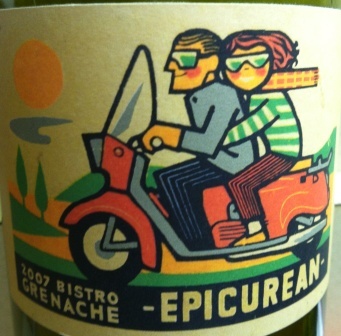 . . tonight’s wine is a 2007 Bistro Grenache from Epicurean Wines. From their website – Epicurean Wines has dedicated the past 12 years to unearthing Australia’s best wines. Owner and founder, Benjamin Hammerschlag, seeks talented winemakers that produce beautifully textured wines of restrained power – wines with finesse, complexity and depth that highlight Australia’s exceptional natural resources. Many of the family owned wineries in the portfolio are located in South Australia with a focus on the Barossa Valley and McLaren Vale but we also proudly tout producers in Western Australia and Victoria – wines that harness the power of Australia without forsaking balance. From us – we will be checking out some of their other offerings!!! It is rated at 89 points and we just gotta tell you . . . it’s berry, berry nice. We were looking for something to assist our digestive tracks tonight and we found it – forget the Tums. From the minute it was opened, it just took over the room – strawberry and raspberry nose and flavors arrived with the screw top coming off. Add in just the right mix of tangy minerals and spices and you get a great wine with no rough edges. Just like the week, and the theme of tonight’s movie – – – it disappeared very quickly leaving us wanting another glass. This wine will now be added to the Top Ten Bondy Deck List! So, sit back, enjoy your Friday night and get ready for a weekend! Whatever you do, remember to enjoy responsibly and recycle whenever possible. Categories: Uncategorized | Tags: 2007 Bistro Grenache, Big Claw, Bruce Wayne, Epicurean Wines, Junior Mints, movie night, Now You See Me, Twizzlers | Permalink.